This story is the first in a series examining the effects on MIT of changes in the regulation of overhead research costs. 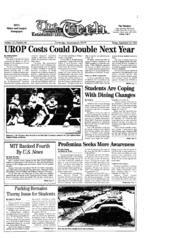 The cost of hiring undergraduates to do research may more than double starting July 1, 1994, because of a change in federal regulations governing the reimbursement of universities for overhead costs of research. "It could have a large effect on the [Undergraduate Research Opportunities Program] unless the situation changes," explained Norma G. McGavern, director of UROP. "It would have a fairly dramatic effect." Currently, the government allows MIT to waive employee benefit and overhead costs for students in UROP. Overhead is charged for services necessary to doing research, but not directly related to a project -- administrative, physical plant, and library costs, for example. Because students' salaries will now incur these added overhead costs, the cost of hiring a UROP student would increase by more than 125 percent, according to Philip J. Keohan, comptroller. Provost Mark S. Wrighton hopes to negotiate a compromise with the Office of Naval Research, which audits MIT overhead expenses, that would allow the current overhead billing practices to continue. "I am very concerned that this change will cause serious harm to the undergraduate experience, and I am exploring the possibility of continuing the current practice of excluding UROP student salaries from the employee benefit and overhead bases," Wrighton wrote in a letter to faculty and administrators on Sept. 10. Wrighton emphasized that the Institute remains committed to the UROP program in an interview yesterday. "I don't think this represents the demise of UROP. MIT has a very strong conviction regarding the importance of undergraduates having experience in research," he said. A survey conducted last semester showed that two-thirds of the undergraduate population was participating in UROP. More than 80 percent of those students received a salary. Last year overhead costs were waived on approximately $4.5 million of these salaries, according to McGavern. The student salaries represented 15 percent of the student financial aid budget. The overhead changes will affect departments and laboratories that receive research grants. "We charged the research projects about $3.6 million worth of UROP salaries," Keohan said. UROPs in the humanities, and other areas that tend not to perform sponsored research, will see no change. In his Sept. 10 memo, Wrighton recommended faculty and administrators to build budgets around the new rates. "It would be prudent to plan for the change in the rules," he wrote. Professors who hire undergraduates could respond in several ways to the new expenses. "The worry is that the students will become prohibitively expensive," Keohan said. In some cases, the amount of money budgeted to hire students through UROP would stay the same, but the number of students hired would be cut by more than half because of the increased costs. The worst case scenario, Wrighton said, is that a professor will decide that undergraduates are too expensive to hire at all. The Center for Materials Science and Engineering will take the first option. The center, which typically hires 22 to 25 students, will simply hire fewer students with the same amount of money, said Virginia Esau, the center's administrative officer. "We're going in competition with other institutions and we want to ask for money [from the National Science Foundation]. The odds are that we will get the same amount ... and we would serve fewer students," Esau said. "Part of our mission is educating students in the laboratory, and we would prefer to educate as many students as possible," Esau continued. The Media Lab, one of the largest supporters of UROP on campus, intends to take a different approach. "We would not be pleased [with the new costs]," said Robert P. Greene '55, associate director for administration and finance at the lab. "We are fairly major users of UROPers and can't picture running a research lab without them." The Media Lab spent more than $300,000 last year to hire UROP students. Greene said laboratories can cut back on the number of students they hire or raise more money, "which has been that path the Media Lab has tended to follow because we are still on a growth ramp." If the changes do limit the number of students working for pay, it will move UROP in exactly the opposite direction of Wrighton's wishes. "I'd like [student participation] to be 100 percent and I'd like it to be greater in depth than it is now," he said. One way to relieve the UROP funding crunch would be to use unallocated funds in the budget to pay for the overhead costs that had been waived in the past. "Unfortunately, given the budget constraints that we're under ... it would be a very, very difficult way of solving it from the MIT point of view," Keohan said. "Doing that would mean not doing something else," Wrighton said. "Before we decide whether we need to recommit some priorities ... we should fully explore the implications of the changes." Wrighton will discuss the possibility of an exemption for UROP with federal regulators. "We have really moved into a new era ... and we need to determine whether this situation is going to be viewed with any special character," Wrighton said. Keohan thinks the Institute is not likely to succeed in negotiating an exemption. The government defines specific budget items that may be excluded from overhead billing, which includes tuition, some equipment, and large sub-contracts, but "it goes on to state that nothing else will be excluded unless it can be determined that by including the item a serious inequity results," he said. The funding dilemma for UROP is "a laudable management goal, but it isn't one where you can demonstrate an inequity is caused in the cost vein," Keohan said. "It's very probable that we will have to convert." "We did have one conversation and we got a sympathetic ear, from the point of view that it is a shame that these things happen and an appeal could be made," Keohan said, but maintained that it was unlikely the appeal would be approved. If the no exception is made, professors will have to pay employee benefits and overhead costs for students on top of salaries. The current rate for employee benefits is 43.5 percent, Keohan said. After the employee benefits costs are added, the overhead is calculated from the new total cost. The current overhead rate for MIT is 58 percent. The net effect of the two costs is a 126.7 percent increase.